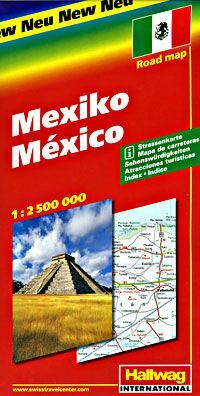 A large, folded, one-sided map of Mexico that is as good looking as it is informative! Iron out the folds and you have a handsome wall map of the country "south of the border." Cities, villages, railways, airports, car ferry routes, and distances between cities(in kilometers and miles) are labeled. Elevation is shown using shaded relief. Extensive index book of place names included. Item Number Size Price Qty.